We work at an office where people love to celebrate birthdays, usually with food. Someone almost always brings in cake, brownies and/or cookies in honor of their co-worker’s special day. A friend at work got creative for one birthday celebration and brought fruit, artfully arranged on wooden skewers. I have been copying her Fruit Kabob idea ever since. One of the best things about the Kabobs is that they look fancy, as if you spent a lot of time slaving over a knife and cutting board peeling, seeding and cutting the fruit ingredients. But, if you are me, the reality is that you bought most of your fruit pre-cut from the grocery store. (To any co-workers reading this: whenever I brought Fruit Kabobs to the office for your birthday, I peeled, seeded and cut all the fruit myself, by hand, just for you). You can find the skewers at any grocery store, usually near grilling items or kitchen supplies. Sometimes these wooden skewers will splinter, in which case, don’t use it. Nothing says “Happy Birthday!” like a splinter in your tongue. I like to vary the fruit by color on the skewer so they look pretty and coordinated (yes, Dan thinks it’s weird that I take the placement of fruit by color so seriously). I started with red grapes, but for some reason did not take any pictures of them. Next up, green honeydew melon. Pineapple for a shot of yellow. This is the first time I used blackberries. I would use them again. This is also the first time I used kiwi. It was a little more difficult to slide onto the skewer without breaking. But it looked cool and tasted good. And another red grape on the end for a little symmetry (no OCD here). In the background you can see the disposable tray used to store and transport the Kabobs. This size will hold 2 layers of Kabobs. We made these Kabobs the night before the Balloon Festival, with every intention of meeting our friends there bright and early the next morning. There are lots of different novelty balloons at the festival. A dragon (I think). Or dinosaur maybe? But the flower might have been my favorite. So cute. The red balloon flew right over our heads, pretty close. Close enough to get a money shot of the flame inside. You could hear the flame thing make a whoosh sound when they flew over. This one flew right over us too. Directly overhead. (Other than a little cropping to center the shot, I didn’t edit this photo at all. That’s really what the colors looked like). Finally, this amazing photo was taken by the daughter of one of our friends at work. She volunteers on the crew of one of the balloon pilots and captured this moment on Sunday morning of this year’s festival. She says that the weather was so calm that they “sat” the balloons on the pond for at least 15 minutes. Awesome. (Thanks to Shelly and her daughter Jenny for the beautiful photo!) The balloon festival is a really fun and different way to spend a weekend morning, and we’ll be setting our alarm extra early next year. The last photo is a winner! Balloon-watching wasn’t the same without the fruit kabobs this year. Seriously, why do you think we always want you to come? Because Foodie Lawyer and Mrs. Foodie Lawyer = fruit kabobs! There was a very cool pirate balloon this year. 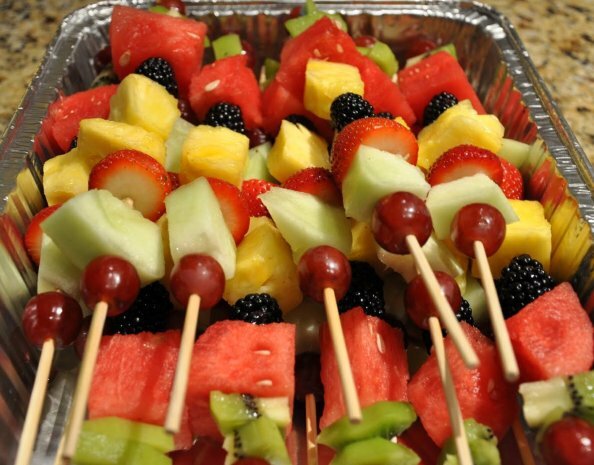 We love fruit kabobs! Will was just snack friend of the week on Fri and this was what he wanted to bring. What a coincidence. The children all learn to wash the fruit and prepare the kabobs. So colorful and makes the fruit all the more appealing! The balloon photos are beautiful. The dino and the flower are our favorites. Thanks for posting all the great pictures!